Biography of Flemish Painter, Noted for Portinari Altarpiece. A major figure in Flemish painting, the Ghent painter Hugo van der Goes, was one of the most celebrated Old Masters of Netherlandish Renaissance art and, as an artist, is considered second only to the earlier Jan Van Eyck (1390-1441). Van der Goes became a master of the Painter's Guild in Ghent in 1467. Famous mainly for his religious art - notably altarpieces - he developed an innovative oil painting technique that influenced Flemish painters and others as far afield as Florence, including Domenico Ghirlandaio (1449-94). In addition, his radiant colour schemes gave his religious paintings a surreal glow. Sadly, Van der Goes suffered a mental disorder and died at the early age of 42, reportedly while suffering severe depression following his efforts to equal the skill of the famous Eyck brothers' Ghent Altarpiece. Van der Goes' fame rests primarily on a single work of Christian art, namely his Portinari Altarpiece (c.1475, Uffizi, Florence) which exerted considerable influence on Italian painters in the 15th century. 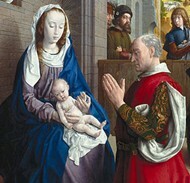 Other notable works include The Adoration of the Magi (1470, Gemaldegalerie SMPK, Berlin), and Portrait of a Man (1480, Walters Art Gallery, Baltimore). His swan-song to the world was his painting Death of the Virgin (1480, Groeninge Museum, Bruges). Hugo van der Goes - alongside Hieronymus Bosch (1450-1516), Roger van der Weyden (1400-1464), Jan van Eyck (1390-1441), Petrus Christus (1410-75), Hans Memling (c.1433-94) and Gerard David (c.1460-1523) - is one of the most important Northern Renaissance artists, yet very little is known of his life. Deductions from records suggest he was born in Ghent around 1440. As he largely gave up painting as early as 1478, and died only a few years later - his artistic career spanned a mere 14 years. Despite this, van der Goes' career was long enough to establish him as a major creative innovator of the Northern Renaissance. Today, there are 15 altarpieces and paintings that can be attributed directly to his hand (none of which are signed; the tradition of signing artistic works only became common practice from the 16th century onwards). Calvary Triptych (c.1465, Cathedral of St Bavo, Ghent) is van der Goes' earliest work, and had long been attributed to Justus of Ghent (Joos van Wassenhove). However, most art experts now agree that it must be the work of van der Goes. In the central panel of the triptych, Christ is nailed to the cross with two thieves on either side. They are surrounded by a group of figures and the city of Jerusalem is visible in the background. The two panel paintings on either side draw their subject matter from the book of Exodus and are even finer. In the left panel Moses plunges a branch into the bitter waters of the Marah to sweeten them for the crowd, and in the right panel his stick is turned into a snake by God. The colours are highly luminous and the shadows are suggested by the use of cross-hatching. Van der Goes used delicate blending of his tones and his etching is precise and masterful. In 1468 van der Goes was involved in creating decorative works for the town of Bruges in celebration of the marriage of Margaret of York and Charles the Bold. He went on to receive more commissions from the town, along the lines of processional banners for other celebrations. His reputation must have been established locally as he was promoted to Dean of the Painter's Guild in Ghent in 1475. Another painting from this period includes Crucifixion (c.1470, Museo Correr, Venice) which depicts Christ on the Cross, mourned by an angel and a female figure, probably Mary. This painting shows great psychological insight, the figures are highly expressive, emotive and clearly tormented in anguish. Van der Goes manages to relate the figures and the landscape in a pleasing manner. His Deposition Diptych (c.1480, Staatliche Museen, Berlin) is equally powerful. This is van der Goes' most famous work. It was commissioned by Tommaso Portinari, an agent of the Medici bank in Bruges in 1468. The altarpiece was for his family chapel back in Italy, and he no doubt specified that it should be created in a Florentine manner. The Portinari is unusual for a Flemish painting of this period, it is distinguished by its size and exceptional quality. The altarpiece is in the form of a triptych, with the Nativity as the central panel subject. When it is closed, the outer panel doors show an Annunciation in grisaille. When it arrived in Italy, it had iconographical and technical significance for the Italian artists who viewed it. In the Nativity, the child lies on the ground, a typical Northern interpretation, and after this period, it became popular in Italy. Oil painting was still primarily a Northern European expertise, and the superb details inspired Florentine artists to adopt with the medium. At this time, oil painting in Southern Europe was relatively uncommon, as tempera was more popular. The luminosity of colour achievable by oils must have been a revelation. To some extent it is possible to see in van der Goes painting, something of his eventual demise into insanity. His figures are highly emotive, crushed by the torment of their situation and the world at large. There is a remoteness in his work, which is particularly evident in his Death of the Virgin (1480, Groeninge Museum, Bruges). This is probably the last painting he worked on before retreating to a monastery near Brussels. The Virgin lies on a bed, her face is an unearthly ashen grey. Her hands are joined in prayer, her fingers bony. Her eyes are lack-lustre as she looks one last time towards heaven. The picture represents a life slipping away, but death has not quite arrived. The Virgin is surrounded by the apostles who are abject in grief, in marked contrast to the Virgin who is detached and remote. 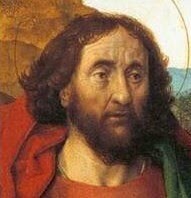 In 1478 van der Goes went into semi-retirement in a monastery near Brussels. From this time onwards he suffered frequent fits of madness, and while he continued to receive visits from rich patrons, he was unable to complete any paintings that we know of. There was a report from a German physician called Hieronymus Munzer in 1495, in which he stated that a painter from Ghent was driven to melancholy by the attempt to equal the Ghent Altarpiece. He may have been referring to van der Goes. The artist died in 1482. Paintings by Hugo van der Goes can be seen in a number of the best art museums in Europe and America.